Hi guys! I hope you are having a lovely Wednesday, I wanted to write a brand spotlight post about the House of CB store in Stratford. I usually focus my brand spotlight posts on beauty but I think a fashion chat is also needed. I visited House of CB on Friday and this was the first time I visited the store. I am usually glued to the website so I was very excited when I found the store in London. If you aren't familiar with House of CB, they sell very glamorous outfits. The dresses are usually priced in the £120 mark and each dress is very unique and perfect for creating or accentuating your curves. I may have to treat myself and buy the Raveena patent vegan dress and if you saw my Twitter video (and the above photo), I am deeply in love with the material and the deep burgundy shade is heavenly. I may be jumping ahead a bit, so lets go back to my first impression of the store. The outside of House of CB is very glossy and L.A inspired, the clear glass windows and lighting really makes the store stand out. As I made my way into the store, I was instantly drawn to the large sale section. 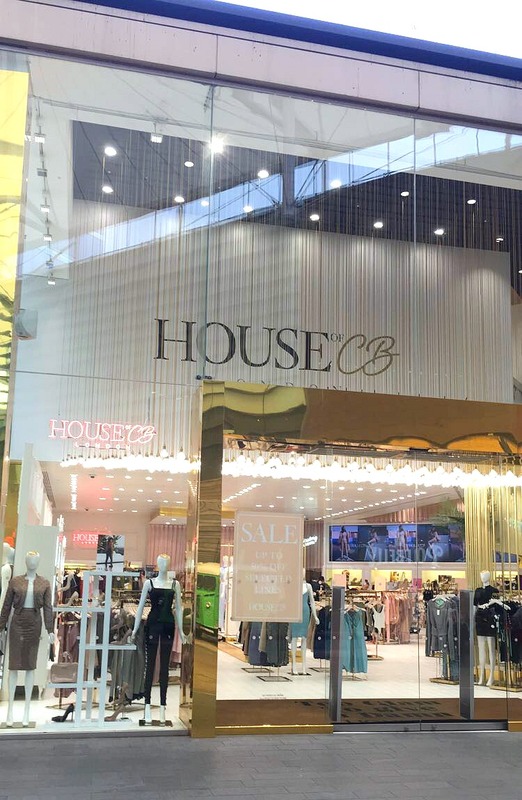 The sale section of House of CB is colour-coordinated which looks very Instagram friendly! I found a gorgeous red latex two piece but I usually avoid cropped tops because I'm quite self conscious of my waist! I tried on a dark brown vegan leather dress and my waist worries instantly disappeared, the fabric clung to my waist and hips and helped create an hour glass illusion. I can't believe how flattering the dress is and although the price is slightly on the pricey side for £119.00, I think this would make a gorgeous birthday dress. After I return from Vegas I will definitely be treating myself! Nice collection of these outfits..